Scientists have unlocked the secrets of how some predatory spiders catch their prey whilst hunting by successfully training one to jump different distances and heights for the first time. 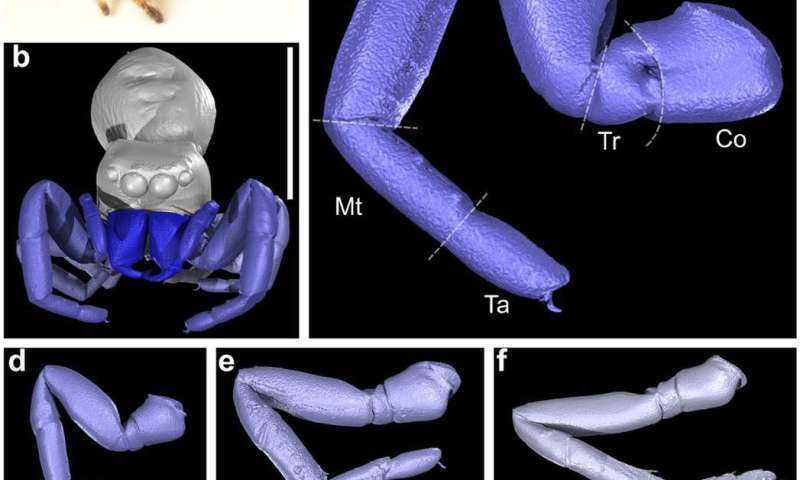 The study, conducted by researchers at The University of Manchester, is the most advanced of its kind to date and first to use 3D CT scanning and high-speed, high-resolution cameras to record, monitor and analyse a spider's movement and behaviour. The aim of the research is to answer the question of why jumping spider anatomy and behaviour evolved the way it did, and secondly, to use this improved understanding of spiders to imagine a new class of agile micro-robots that are currently unthinkable using today's engineering technologies. Dr Mostafa Nabawy, lead author of the study, says: "The focus of the present work is on the extraordinary jumping capability of these spiders. A jumping spider can leap up to six times its body length from a standing start. The best a human can achieve is about 1.5 body lengths. The force on the legs at take-off can be up to 5 times the weight of the spider - this is amazing and if we can understand these biomechanics we can apply them to other areas of research." The researchers trained the spider, which they nicknamed Kim, to jump different heights and distances on a manmade platform in a laboratory environment. Kim belongs to a species of jumping arachnid known as Phidippus regius, or 'Regal Jumping Spider'. The team then recorded the jumps using ultra-high-speed cameras, and used high resolution micro CT scans to create a 3D model of Kim's legs and body structure in unprecedented detail. For example, to jump shorter, close-range distances Kim favoured a faster, lower trajectory which uses up more energy, but minimises flight time. This makes the jump more accurate and more effective for capturing its prey. But, if Kim is jumping a longer distance or to an elevated platform, perhaps to traverse rough terrain, she jumps in the most efficient way to reduce the amount of energy used. Scientists have known for more than 50 years that spiders use internal hydraulic pressure to extend their legs, but what isn't known is if this hydraulic pressure is actively used to enhance or replace muscle force when the spiders jump. Dr Bill Crowther, co-author of the study, explains: "Our results suggest that whilst Kim can move her legs hydraulically, she does not need the additional power from hydraulics to achieve her extraordinary jumping performance. 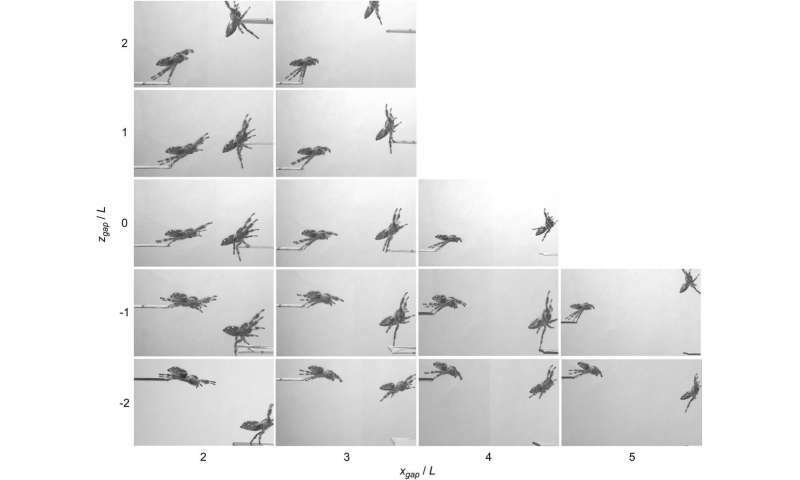 Thus, the role of hydraulic movement in spiders remains an open question."